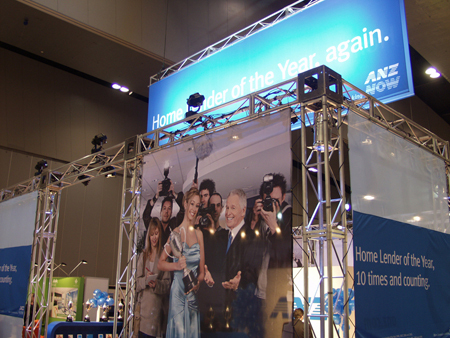 In August 2008, CLS provided truss, rigging, banner-support and lighting for the ANZ stand at the First Home Buyers Expo. A large quantity of 300mm Box Truss was cleaned especially for the event, as is customary for our corporate work. The result, a gleaming structure of industrious design, bold and powerful, with a welcoming interior. 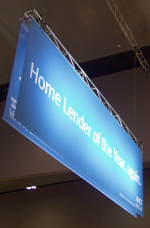 Half-opaque banners helped to make the stand draw people inside - the outside left intentionally dark for this purpose. 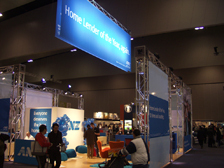 The 9m x 3m banner flown from the ceiling was lit with six MSR Multipar lamps (three per side), making it truly luminescent from any point in the hall. 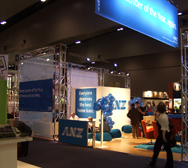 10 Par 64 lamps were installed in the truss legs to provide the steely ANZ corporate blue, adding to the overall effect. 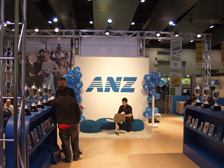 24 ETC Parnels in all were used for stand lighting, providing adequate coverage and a homely feel, whilst also illuminating the signage. 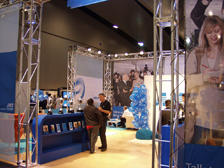 CLS is no stranger to corporate events of all kinds, including product launches, press conferences and exhibitions. Next time you're planning an event, contact us for an obligation free quote - with our knowledge of venues and events, 3D CAD design service to help you visualise your stand, and continuous on-site event support, we're committed to helping you achieve your goal.